Manage Metadata Easily with RSSeo! Home / Blog / Manage Metadata Easily with RSSeo! Helping people easily find your website remains a complicated task. As a marketer or business owner, the main focus is on making information accessible to the people looking for answers online, because that step is now just as important as distributing a product or making a service accessible. To help you, RSSeo! keeps an eye on the ever changing way people look for answers online and on the latest search engine optimisation requirements, this way maintaining your SEO performance. If you need a guideline on how to install RSSeo!, you will find one here: Performing an Installation. Before you can analyse your data, you have to crawl your pages. Go to your component and click on Crawler. Click Start to get your pages crawled. The crawl process has been significantly improved and enhanced with the option to skip links that have the rel="nofollow". To find out more about the crawling process read this documentation article on the Crawler. SEO requirements are numerous with many best practices and recommendations - that's why we have made it our mission to offer you a SEO solution that is not only easy to use, but offers a simplified overview of all these requirements you followed and enforced in order for you to make the best decisions. Easy Metadata view & Editing with RSSeo! The RSSeo! view has now been refined so you have a global view of your metadata. Go to Pages and you can see that all of your website pages have been analysed SEO wise; you have a general overview of your SEO efforts for each page. This allows you to compare the SEO details for each of your website pages, all in one place. In the past you had to click on a certain page to see the SEO details for that page, but now you have a view of all your website pages in one place. how you configured your page URLs; you can see if you maintained the same standard and keyword level for the URLs of all your web pages. you can quickly analyse the page title for any given page. the keywords used for each page, to see where your page and website stand, how they rank for those keywords that are important for your business. page level and the last date when it was crawled. page grade comparison between pages, because the RSSeo! 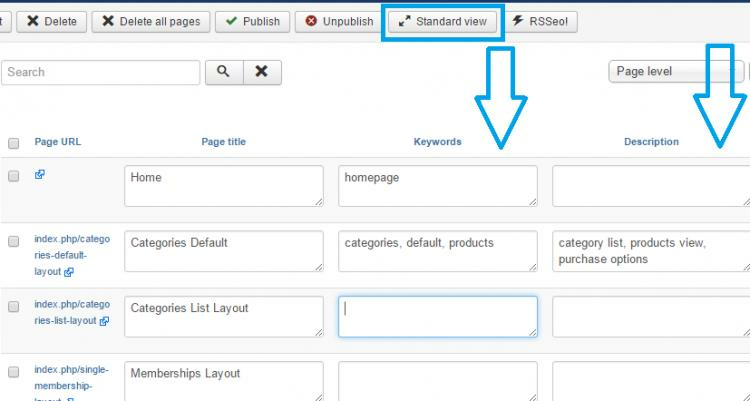 system displays a SEO grade with possibility of editing the page details to improve the grade right away. and if the page was added to the sitemap or not. And that's not all because now you can also edit your metadata easier than ever with our multiple page metadata editing view. Simply switch to the Simple view and you'll be able to edit multiple pages at once. All there is left to do is to edit metadata details for more than one page at a time, just like in the above image. Basically you get more done with less hassle. Make the changes you want in your meta data, include better keywords and adapt your meta description and titles and click Save & Close. That's all to it! Easy, safe and fast. You can check out all the latest RSSeo! 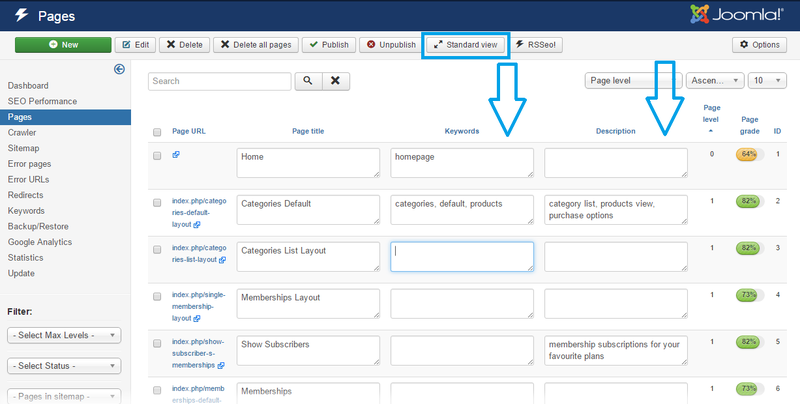 features and improvements in the following article: Joomla! SEO ready with the newly updated RSSeo! version 1.19. Would you like to test it before purchase? Sure! You can tinker with the extension by means of the demo installation. If you want to purchase a RSSeo! subscription, do so from the RSSeo! extension product page. If you want to renew your subscription you can do so benefiting from an automatic 30% discount on your renewal.